Microsoft Lumia 950XL is coming our way with loads & loads of pretty cool features like the Continuum and the triple LED Flash led – 20 MP Camera. These features have been talked about in details at many blogging websites and video reviews. But there is one feature which will definitely make the this smartphone stand apart is - it’s Wireless Charging Support along with Fast Charging USB Type-C port which assures us of up to 50% charge in around 30 minutes. 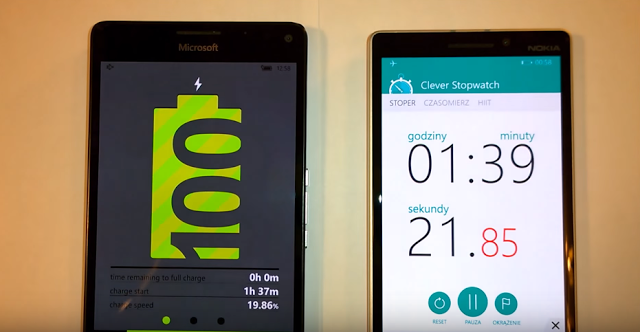 To test this out we managed to get a demo video from Martina A Wojcik, an independent developer from eastern europe, our newest product for Windows Phone platform is Battery Super Saver. We reached 50% after 36 minutes and 100% after 1 hour 39 minutes, which is an amazing result if you bear in mind such a big screen and large 3300 mAh battery. In comparison Samsung Galaxy S6 Edge with 3000 mAh battery needed 35 minutes to charge to 50% and 2 hours to charge to 100%.